Note: NOT to be used for material containing free liquids. HAZPlus Advantages Fiberboard IBC system consists of outer UN11G/X marked carton, 6-mil poly liner, 2 cap nails and assembly and use instructions. 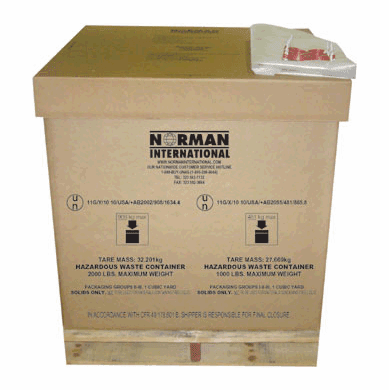 2-way hardwood pallet not included (purchase separately) Container system has been tested and certified to meet the requirements of49CFR 173.800 for Packing Group I,II, & III hazardous products. Constructed of heavy-duty reinforced triple wall corrugated materials. Ships and stores flat 40 per pallet for transportation purposes. deal for transporting and storage of both hazardous and non-hazardous materials. Approved for 2000 pounds of PGI, PGII, or PGIII materials. Replaces up to four (4) 55-gallon drums. Tested to be stacked up to 2 high when full. Dimensions are 36x 36 x 36; volume is one cubic yard. BG2CN Non-UN rated, 2 wall cubic yard box and 6-mil poly liner.